When I began teaching in rural, predominantly Black, Arkansas, I couldn’t tell my students apart. As a white woman from Michigan suburbs, I frequently would find myself blanking on, switching, or butchering my students’ names in spelling and speech. I was embarrassed. Teaching, especially in an environment that was so foreign to me, felt utterly impossible. At the time, I attributed this to my failings as a person, as a teacher. Now, I attribute it to much more than that. One critical component is systemic and institutional racism and another is the chronic issues with supporting struggling and new teachers in education overall. I couldn’t tell my students apart because rarely had I been in a predominantly black environment, and never one in which I needed to personally know everyone in the room. Instead of seeing my students as individuals with unique talents, families, aspirations and challenges, I saw a blur of bodies that I didn’t know how to interact with. We spoke a different language, moved to different beats, and had entirely different lifestyles that seemed to have no intersections aside from being in the same physical space at the same time. 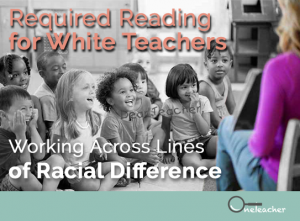 If you are a white educator working across lines of racial difference like I was, it is critical that you learn yourself and learn your students. Without a deep understanding of your own culture, your own bias, and your own socialization you will never understand how white-dominant culture is embedded in the way you tell Diamond to sit down, the way you require your students to be silent while taking notes, and the way your class sits by gender in the cafeteria. In public education, “institutional racism” is a whisper that many don’t believe in or refuse to talk about. It is not the job of the Black student or Hispanic teacher across the hall to tell you you’re being racist without meaning to or even being aware of it. Racism is not only deliberate discrimination against other races, it can also be accidental and unintentional. It happens constantly even as we build the awareness to actively resist it. It is our job as white people to build our own understanding of the systems that oppress and the methods of liberation. It is our job as white people to seek to understand, to listen significantly more than we speak, and to read and dialogue when we are confused or concerned. This work is exhausting, without end, and requires a step beyond comfort. It is also collaborative, critical, and full of growth. While it can be daunting, this reading list is a place to begin. This is a primer for learning about racial identity development, written in quick chapters with lots of anecdotes. While it focuses primarily on Black and White identities, Tatum also includes Latinx, Native American, Asian American and Pacific Islander, and multiracial identities. Read this book when you want a grasp on understanding how race impacts all of us on a daily basis at any age. Written as 64 stand alone essays by the top race and education experts in the country, this book gives very concrete strategies and techniques for combating racism on a daily basis in your classroom. This book touches on diverse identities and situations; it’s easy to open to a random page and find a solid tip very quickly. Read this book when you’re trying to do one small thing every day to make a better environment in your school. This book is all over the news, social media, and everywhere else for very good reason. It details how the current US prison system was built upon the same principals as slavery, and thus perpetuates the same ideals. A jarring chronicle of modern racism, it is very worth the time needed to get through the dense text. Caroline Lampinen‘s education work has included classroom teaching, coaching, facilitating, advising, professional development designing and leading, writing curriculum for adults and students, and her most favorite role: Diversity, Equity, & Inclusion Facilitator. She’s worked with both traditional and alternative-certification teachers, districts and programs. While passionate about classrooms, she is even more passionate about building an inclusive, loving, and warm world in which all people can be, grow, and exist as their best selves. She currently lives in Baltimore with her dog and too many notebooks and has recently launched on Medium–check out her other work here: https://medium.com/@carolinelampinen. 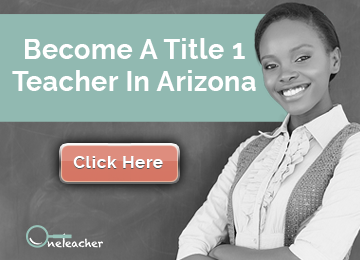 Take the hassle out of finding teachers. 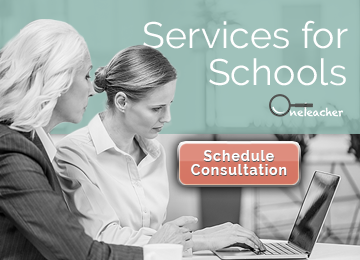 Contact One Teacher today to partner with your school.